All products of Old World Mettle are sold as artworks and are to only be used and bought by adults. 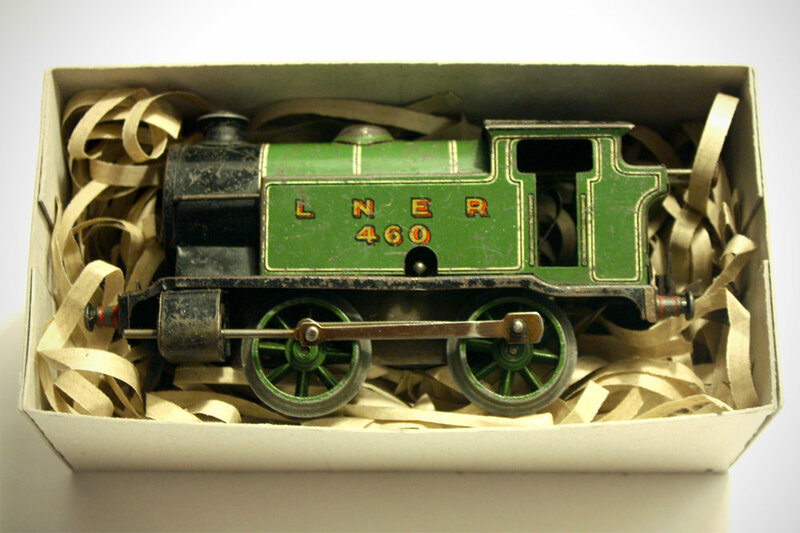 O-Gauge clockwork locomotives hit the scene in 1920, after the success of Meccano had begun to fuel a generation of of tinkerers and backstreet mechanics. A robust and luxurious tinplate construction with a rich stove-enamelled black finish made these the toy of choice throughout England and beyond. The range continued and advanced to include large 4-4-2 engines known as ‘special tanks’, representing steam heroes such as the Flying Scotsman, and on further to offer electrified systems too. Finally running out of steam in the 1963, there’s been nothing quite like it since. So yes, It’s possible to find one that survived the war, a couple of generations of being thrown off tracks (down stairs, shot with air an rifle…) and that still runs today. Highly collectable, rare and beautiful. These have a complete magic to them that can only be seen when it’s wound, popped on rails and ‘click’ - whoosh… (chatter-chatter-clunk-clunk-whizz). They run in both directions, have a lever operated stop, go like the devil on their own or can be put to work pulling a couple of carriages, all on a spring older than the LP record. Not bad.